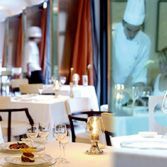 Alfonso Iaccarino’s restaurant insider the super-posh Aldrovandi Palace Hotel in Parioli is stylish and costly (the top suites can run more than €3,000 a night). Iaccarino’s background (he masterminded Michelin-starred Don Alfonso) is the Amalfitano south and the menu shows it. Pomodorini abound, red and ripe. The risotto ai frutti di mare feels straight-from-the Amalfi coast. In the middle there’s rabbit and other game, borrowed surreptitiously from Tuscany. The high manners (cloches over the pasta; no-price menus for women guests) comes at a high price — €120/140 a head and up (what do you expect for raved-about stockﬁsh and red pepper cannoli). Lots of Russian spoken in the lobby, which says a lot about the life and times of Rome circa 2008.